How Repairable is Your Mobile Device? Microsoft recently took a pasting, for example, but Google and Apple are only ranked just higher. 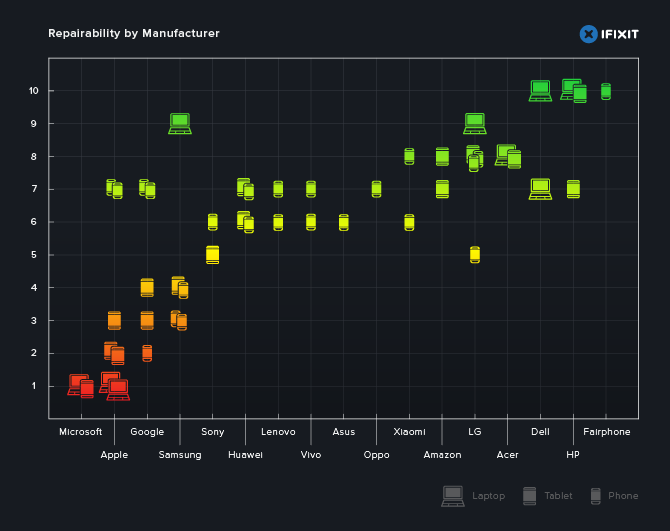 And HP and Dell lead the way for repairable devices, behind Fairphone. Xiomi, LG, and Acer are the next group. 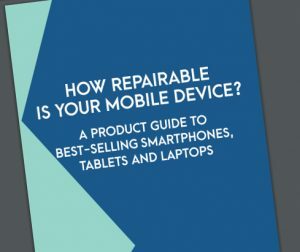 The report is called How Repairable is Your Mobile Device? Overall, they looked at 40 best selling smartphones, tablets or laptops, launched between 2015 and 2017, which were produced by 17 brands. The assessment is based on iFixit’s repairability score, which considers the time required to repair the product, the device’s upgradability and modularity, as well as the availability of spare parts and repair manuals. The assessment is based on iFixit’s repairability score, which considers the time required to repair the product, the device’s upgradability and modularity, as well as the availability of spare parts and repair manuals. Anyway, check our the graphic above for yourselves. 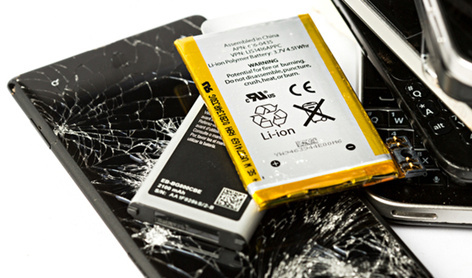 Key findings of the report cover a worrying trend away from repairability (design complexity, combined with the practice of soldering or gluing separate pieces together, means repairs take longer), the use of non-replaceable batteries (nearly 70% of all devices tested had batteries that were impossible or difficult to replace due to design decisions), non-standard tools being required (for working with proprietary screws, for example), and no access to repair manuals or spare parts (out of the 17 brands represented in the survey, only three – Dell, Fairphone and HP – provide all spare parts and repair manuals).